Thomas Nelson's line of eBible resources gives readers the best and most comprehensive digital collections of titles from their favourite authors and specific subjects. eBible resources also provide one-click searching and extensive cross-referencing to make studying the Bible easier and more efficient than ever before. David Jeremiah Essential Bible Study Library by David Jeremiah was published by Thomas Nelson in May 2010 and is our 10776th best seller. 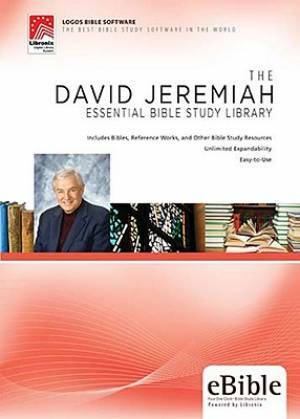 The ISBN for David Jeremiah Essential Bible Study Library is 9781418543679. Be the first to review David Jeremiah Essential Bible Study Library! Got a question? No problem! Just click here to ask us about David Jeremiah Essential Bible Study Library.